Kaye was set on having a piñata at her ice cream party. That was pretty much her only request for her party. 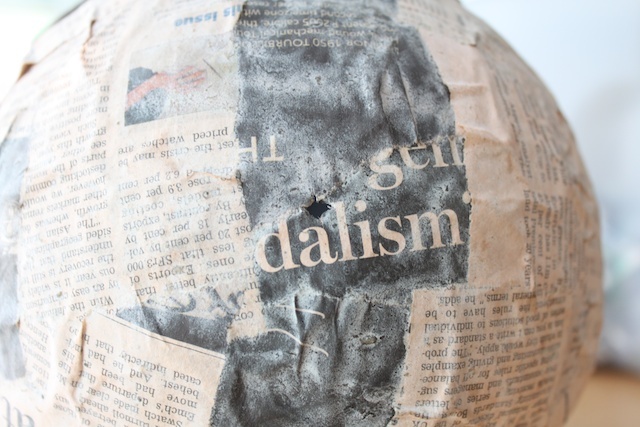 The last time I made paper maché was in elementary school. But if elementary school age kids can do it, I was sure I could make one. 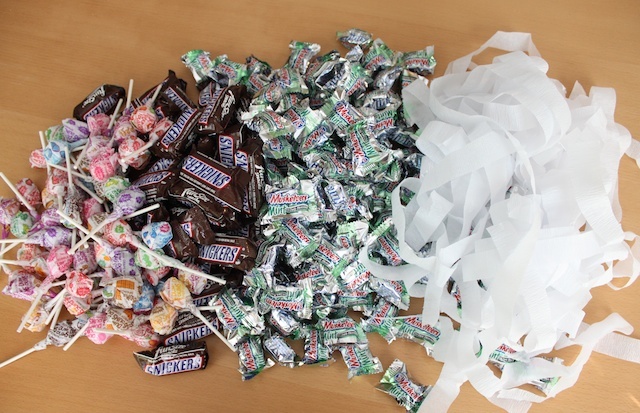 Plus, this way I can have the colors match the party and stuff it with good candy that the kids will actually enjoy. Tips about making a piñata: Start at least a week before the party. Just about each step requires about 24 hours of drying time. 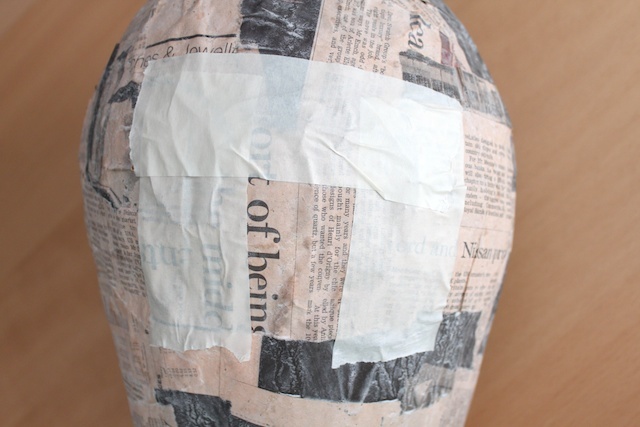 I did most of the paper maché at night so it can dry over night and through the next day. Remember, if you made something inspired by Simply Modern Mom, please upload pictures of it in our Flickr group to show it off to everyone. You may be featured on Simply Modern Mom. 1. 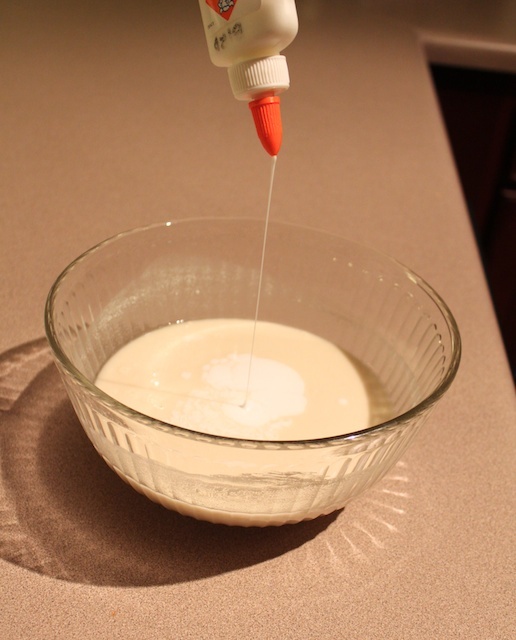 Make your adhesive mixture by combining the flour, water and glue. Mix well and do your best to get as much of the lumps out. 2. 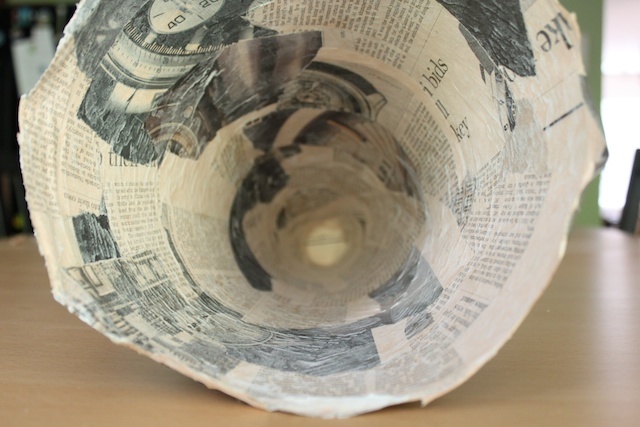 Tear newspaper into 2-inch pieces. It doesn’t have to be perfect. 3. 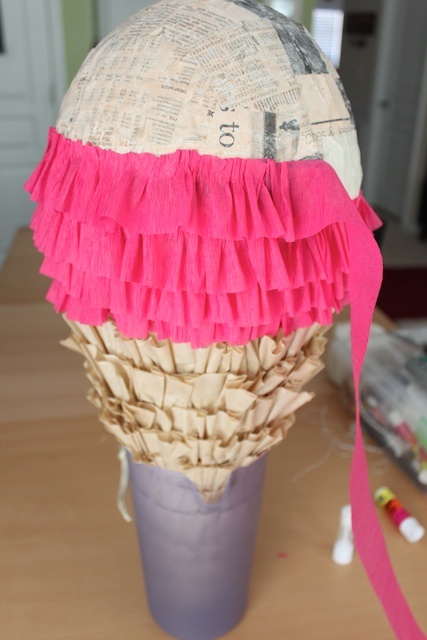 To make the cone of the piñata, get a poster board and cut the length in half. Then roll it to cone shape and tape together using packaging tape. 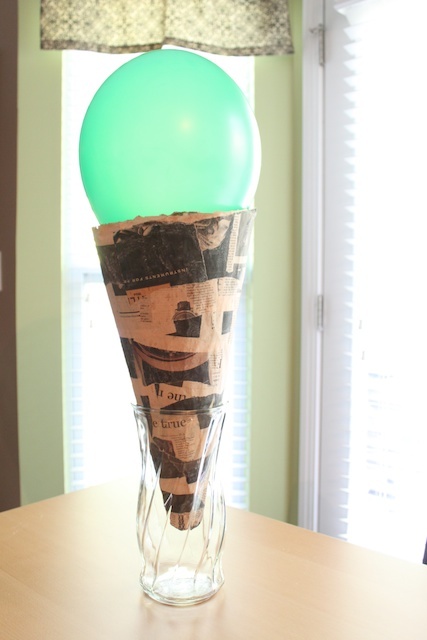 Blow up the balloon and use that to measure the opening of the cone. Trim the top of the cone so that it is even. 4. 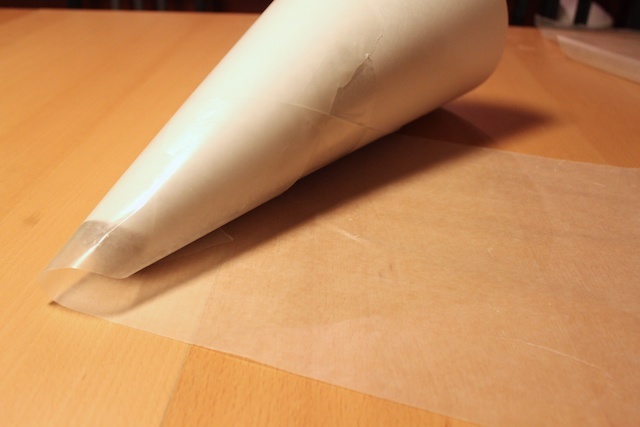 Cover the cone in wax paper so the poster board cone and wax paper can be removed later. 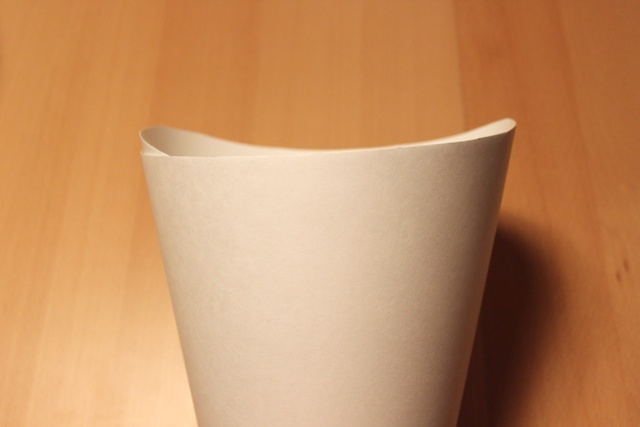 Tuck wax paper in the bottom and top of the cone. 5. 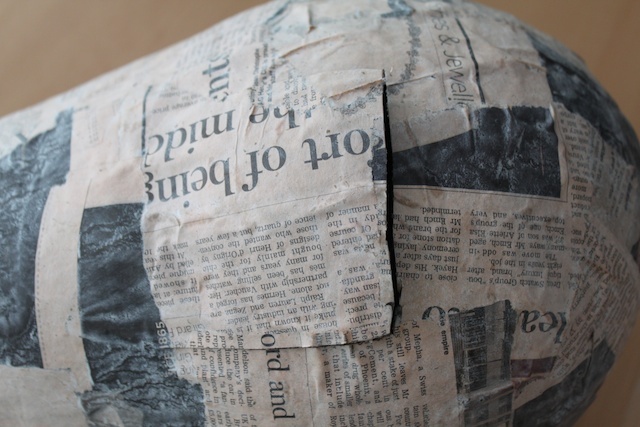 Start the paper maché by dipping a piece of newspaper in the adhesive mixture. Stir often because the flour and glue settle. After you dip the paper, run the paper between 2 fingers to remove the excess. Cover the cone from top to bottom one layer at a time. Don’t do more than 3 layers. Any more than 3 layers will make it too hard for the kids to hit open. 6. 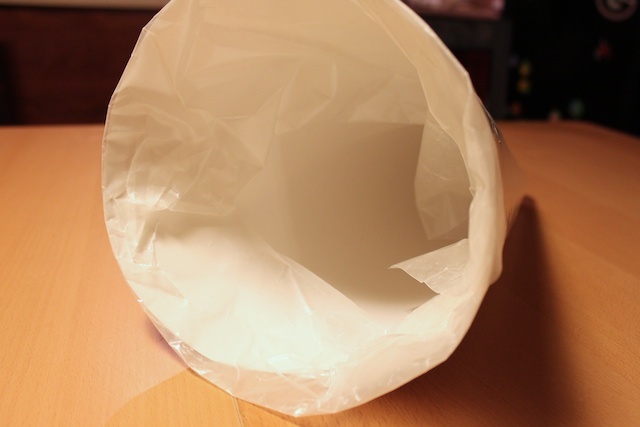 Allow to dry for 24 hours then remove the poster board and wax paper from the inside of the cone. 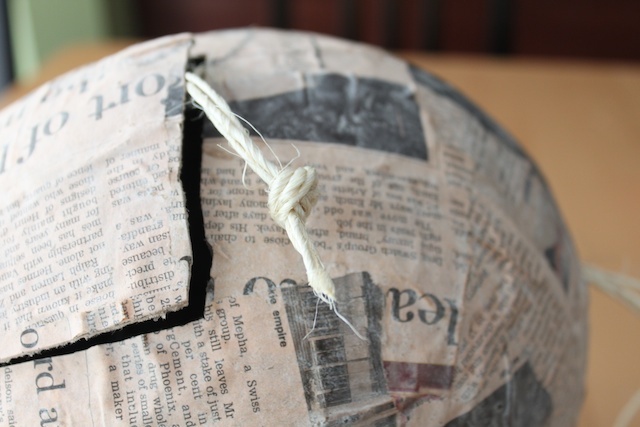 The wax paper should peel right off the paper maché. 7. Blow up the balloon and have it fit on top of the cone. Set the cone in something, like a large vase. 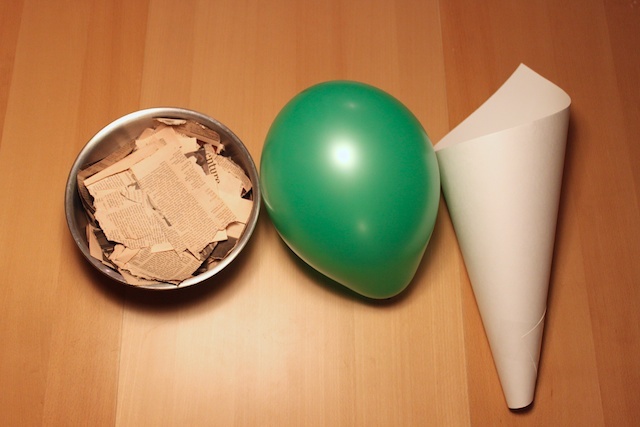 Then paper maché the ice cream. Do 3 layers like you did with the cone. 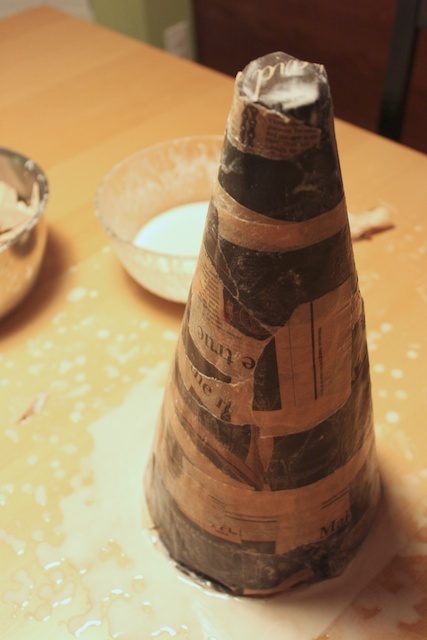 Paper maché over the cone to connect the ice cream with the cone. Allow to dry for at least 24 hours. 8. Once everything is dry, cut an opening flap with the exacto knife, only cutting 3 sides, on the ice cream part of the piñata. Make sure the opening is big enough for you to stick your hands through. As you cut the opening, that should pop the balloon. Remove the balloon. 9. 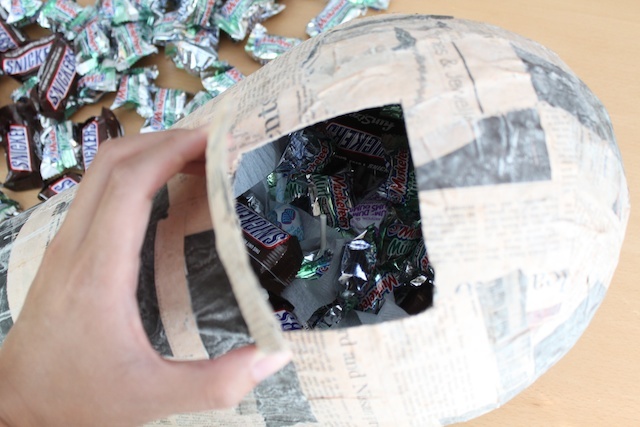 Stuff the inside of the piñata with candy and crepe paper so all the candy doesn’t all settle at the bottom. 10. Using the knife again, cut an X at the top of the ice cream for the rope. 11. 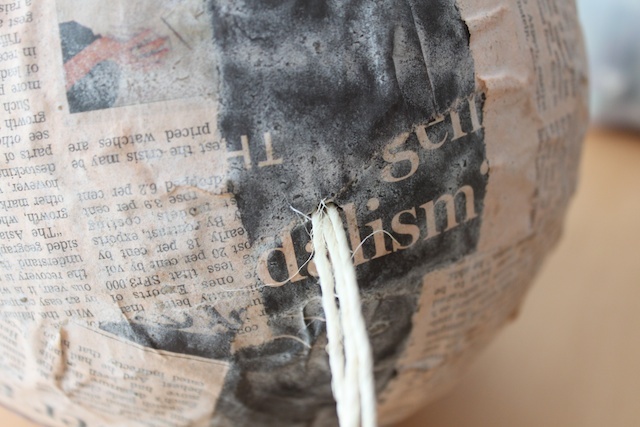 Thread the rope through the hole and tie a knot on the inside of the piñata. Make sure the knot is large enough that it doesn’t pull through the hole. You may need to double knot it. 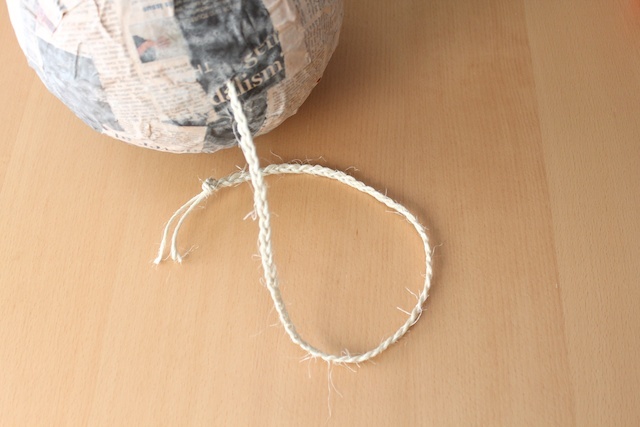 I used twine and braided it to make it stronger. 12. Tape the 3 sides of the opening with masking tape. I discovered that the clear packaging tape doesn’t stick to this surface. 13. 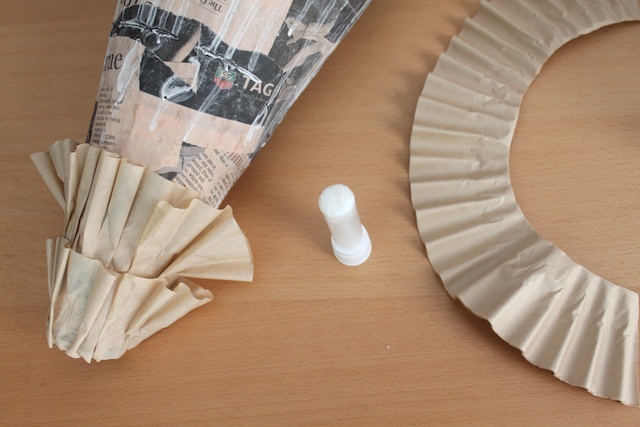 Cut out the bottoms of the coffee filter so you only use the ruffled sides. 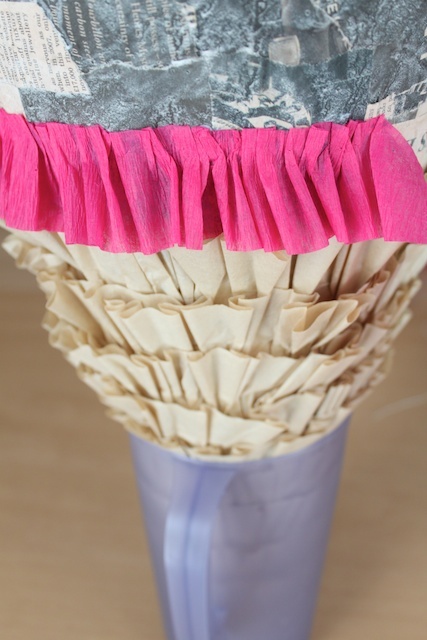 Then use glue sticks (I used the strong permanent glue sticks) to glue the coffee filter to the cone part of the piñata. I found it easier to work the layers from the bottom up. 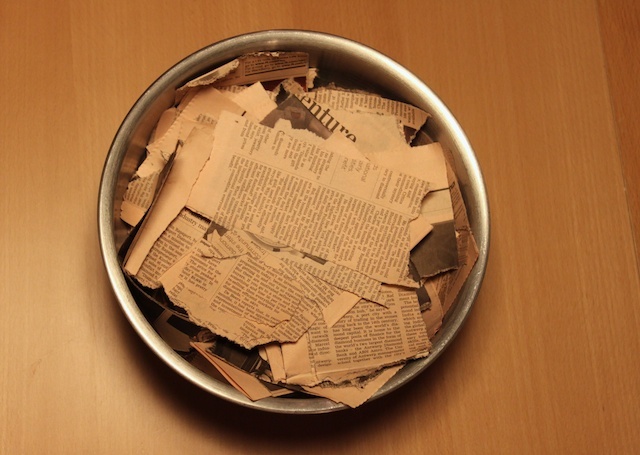 I used unbleached coffee filter because I couldn’t find brown crepe paper. 14. 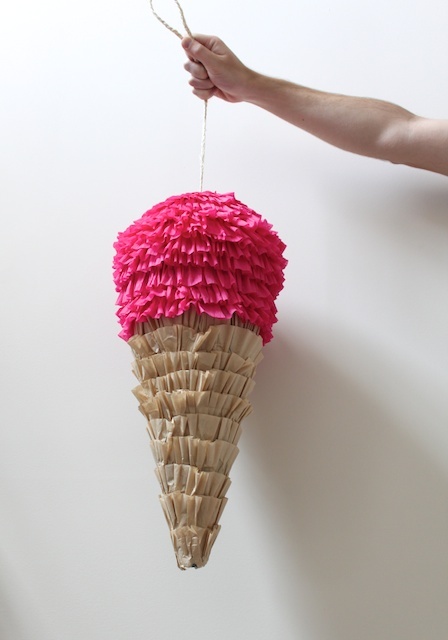 Once you reach the ice cream portion of the piñata, start with the crepe paper. Also using the glue stick, work your way up to the rope. And done! » Tell me… Do you make your own piñata or do your purchase them? What kind of candy to you like your children to eat? I broke down and bought one for my son’s party this weekend. It was our first one here and I wasn’t up to the task of trying to figure out how to make a monster truck pinata. Obviously, neither are the party people because we couldn’t find one ANYWHERE. We used a Lightning McQueen pinata since it was a vehicle. I enjoy making pinatas for our children’s birthdays. I’ve made a flower (with 5 balloons, stars, and most recently, Thomas the Tank Engine. Fab!!! Fab!!! Fab!!! Love it!!! I don’t have children and have therefore never made or purchased a pinata; however, I do love to eat candy! My fav’s are: Oh Henry, Swedish Berries and any dark chocolate with marzipan or! or milk chocolate with hazelnuts! i never knew I could make my own! Thank you! Awesome! I love it! Great idea using the coffee filters. I’m currently making a pokeball pinata for this Sunday evening. I hope it’s done in time! When my children were small we made pinatas for many birthdays and parties. We tried every shape; Hearts, horses, letters.,, and would often put tiny toys from the dollar store or small erasers or toys from garage sales along with the candy. I remember little rubber snakes. Fringing the crepe paper was a tedious task but so festive! wow! this is beyond perfect. i want to make one and throw a party! I made a pinata for my fiance’s birthday. He loves Abe Lincoln, so I made a big Lincoln head. It was huge and a total blast for his party. It took forever to bust it, I think I made too many layers. The tip for three is good. 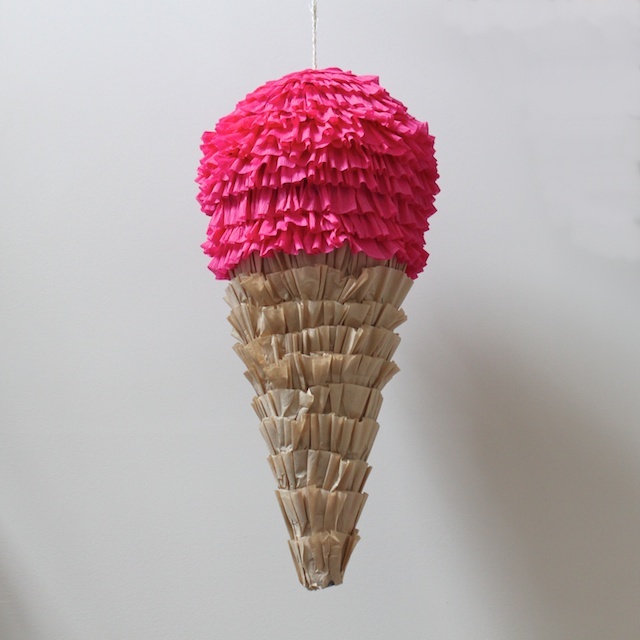 I love this ice cream cone, it inspires to make some pinatas for our wedding. I wonder what shape I could dream up for a wedding besides bells. Thanks for sharing your fabulous ideas. Bravo! Awesome tutorial! You have inspired me to go ahead and try to make my own. Thank you! We make our own out of leftover cardboard, masking and packaging tape and tissue paper. They always look kooky but we make them together. We go nuts at the dollar store, getting a wide variety of candy. I always put in a few pieces of big sized checkout aisle candy to make it a little exciting. Plus, I keep candy on the side for the wee ones who are put off by the pinata mob scene but still want candy. My favorites are SweetTarts, Nerds + Now & Laters. seriously, oh my goodness. i just saw this at childmade and was like “NO WAY!!”. This is the cutest pinata ever!! This is such a terrific idea! Thanks for sharing.